Nevertheless, it's a day worth celebrating as we survived the entire week! YES!!! Let's give ourselves a nice pat on the back for a wonderful job! As for me, aside from a huge pat from Mr. AMW (He treats me like a li'l puppy at times..lol), I finally have scheduled a hair treatment! Finally!!! I haven't had my hair color redone after THIS. Speaking of hair, you won't believe me if I tell you that I have so many queries over email regarding the Spin Pins and what-nots. Honestly speaking, I find myself loving my hair down so I never really took interest on purchasing these. 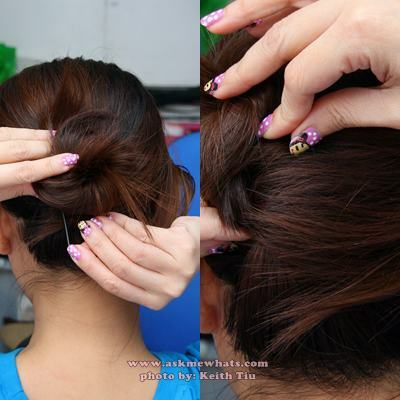 So Php88.00 (approx $2.00) for both the spiral pins and the chignon-maker (I invented the term by the way), not bad! Looks like a "Eureka-moment" post worthy! Instructions at the back. They were all written in Japanese but you'll get the drift just by looking at the step-by-step diagram. My hair is super layered by the way so twisting it into a bun will always be a challenge! Out of the 2, I like the one for modern updo better! I find it easier to manuever with my current hairstyle! I gather my hair into a mid pony tail. Twist the ponytail as you wrap it around your head to create a bun. Insert the pin upwards through the base of the bun. With a light hand, twist the pin going downwards for it to be secured. As you can see, the pink is hidden yet, I have this huge chunk of chicken hair showing, you can choose to leave it that way or you can secure them with bobby pins. Ahhh, the agony of layered hair! Overall, I still prefer a regular hair elastic to create casual looking updo on a regular basis but, I will definitely recommend this set to anyeone with medium to long hair minus the extreme layers! 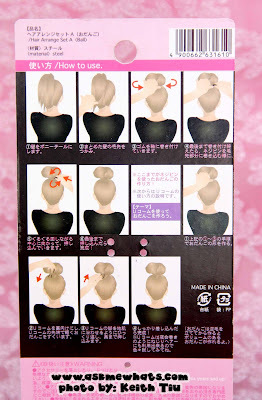 For the price of less than a hundred pesos, the Daiso Hair Arrange Set definitely deserves its Eureka Moment slot! 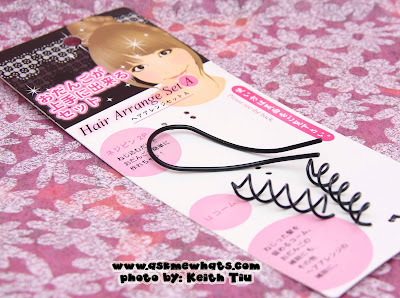 You can purchase these at Daiso at the hair accessories section. Have you used a similar Hair Arrange Set? oh wow, sabi nga nila if your hair is too long and thick mahihirapan talaga! So baka kelangan mo 4 na spin pins? hehehe :) Well back to basics ka na lang, hair ties and bobby pins! hehehe glad to share :) Ang mura no? 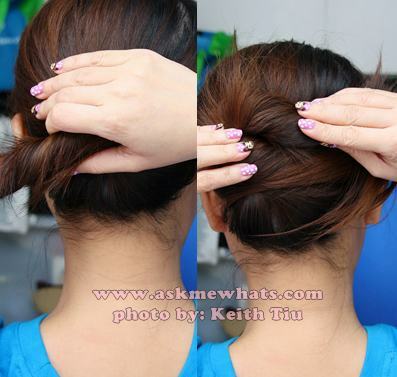 i love the chignon du cou style! I wish I have more length to my hair to create a perfect look. Yay! share more ways to use this, Nikki! I will definitely share more ways! :) Soon! :) Thanks dear and see you soon! I bought this also at daiso kaso failed d pa mahold sa hair ko. Or its just me d pla marunong hehehe. Sounds like a great set! Love the hairstyle you did with it! I just bought one of those in Tokyo (for 105 yen... coz I didn't know that Daiso here in the Philippines had it lol). I love how it's so cheap. Other spin pins cost around 500 pesos. Crazy. wow, it's cheaper in Tokyo then, now I'm excited to visit Tokyo's Daiso! hay naku! I know what you mean about layered hair! oooooooohhh I'm sure you look great! Ate nikki, meron din po akong nakita na ganito sa vente. :) pero mas maganda ang packaging nito. Haha.